The faculty of Pharmacy and Drug Manufacturing held its 1st Recruitment Forum on Tuesday, 2 April, 2019. The forum was convened to get a feedback from labour market associations regarding the qualifications of the graduates of the faculty of Pharmacy and Drug Manufacturing and assess the quality and benefits of the academic activities and researches conducted by the faculty of Pharmacy and Drug Manufacturing which all aim at effectively contributing towards development whether in the environmental or entrepreneurial sectors in Egypt. The forum was held also to promote cooperation between the faculty of Pharmacy and Drug Manufacturing and different labour market associations, thus offering the graduates job opportunities. 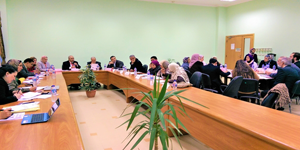 Pharos university was represented in this forum by Prof. Mahmoud Mohy El Din, the President of Pharos University, vice presidents, Prof. Maged El Ghazouly, the Dean of the faculty of Pharmacy and Drug Manufacturing, faculty members and the Director of the PUA Quality Assurance Centre. Meanwhile, labour market associations were represented in this forum by chairmen of the boards of several pharmaceutical companies, clinical pharmacies directors and inspectors, medical representatives, directors of public-sector pharmacies and marketing managers of large companies. A large number of the faculty graduates as well as their parents also attended the forum. The coordination of the forum was managed by Dr. Enas Massoud.